The house features Queen Anne massing with Richardsonian detailing in the stone and arches at grade level. Windows and window trim are in the mode of Colonial revival. Some windows for the project were designed by artist John La Farge. [Blodgett-2001 65.] 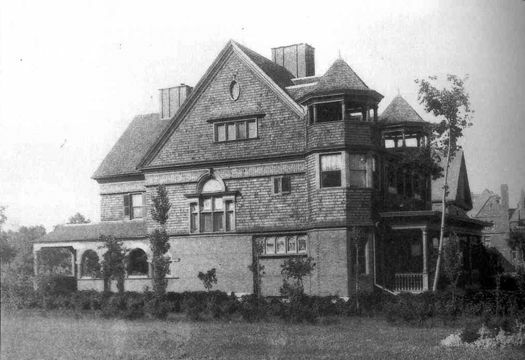 The shingled second story was intended to be set off by pebble-embedded stucco in the third-story gables, but shingles replaced the stucco during construction. The building's contractor was Paul Haupt, son of the former Northern Pacific Railroad general manager. Adams was a grain dealer who was reputed to own one of the finest libraries in the Northwest. Gilbert would later design a house for Adams's son on adjacent property. Both houses were razed at an early date, for neither exists on the 1928 plat map.